Welcome to Takeuchi-Naoko.com! This site is NOT the official site. 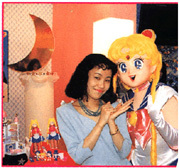 You can find the official site here: Sailormoon Channel Or Jp. Yes, it's in Japanese. So have the auto-detect Japanese ready.